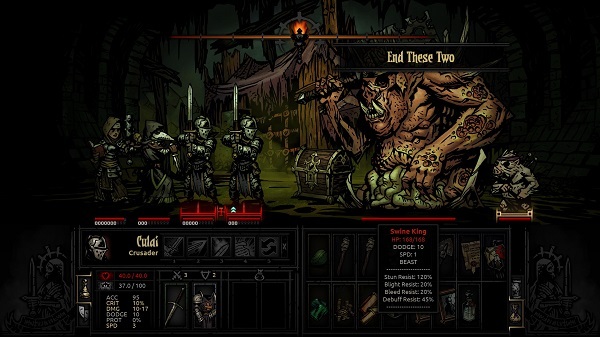 Darkest Dungeon is a rogue-like developed by Red Hook Studios, and it has escaped Early Access this week. We’ve been keeping an eye out for this game since we first heard about its Kickstarter campaign back in February of 2014. Darkest is your classic rogue-like where the player has to accept death with arms wide open, and continue to move forward, even though if that means walking on a road paved with the skeletal remains of your party members. You see, your allies will most likely die, and, inevitably, some of them will go insane – not with power, but with actual mental illnesses. You can make them better, fixe’em up, but if you pour too many resources into them you’ll eventually go broke. It’s best to cut your loses and move on with your dungeoneering-ways. Darkest seems to be a traditional rogue-like yet it has a pretty important mechanic that differentiates it from the tried and tested genre – death doesn’t mean the end of your run. 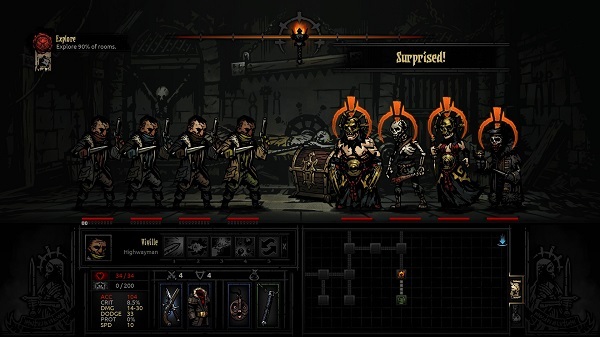 Read our Darkest Dungeon Review for more. Death, he who ends worlds, won’t end your Dungeon runs in the game – as you’d expect from a rogue like game. While it gets the core of FTL, Skyshine’s Bedlam, and The Banner Saga, it’s more akin to Rogue Legacy – in terms of dying. Sure, once a character is dead, it stays dead, dungeons are random, there are objects that can tremendously help your party, and there are other items that prove to be all sorts of nuisances, but there’s more to it than just the traditional rogue like setting. 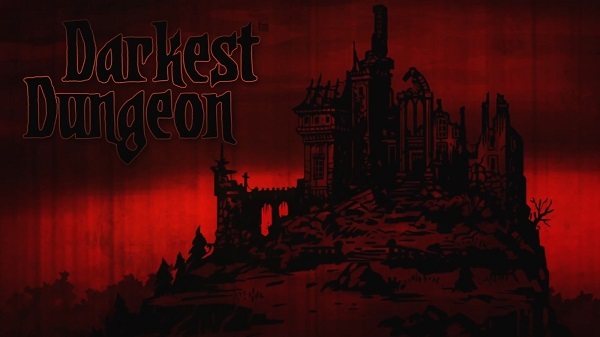 Darkest Dungeon is tough, it’s unforgiving in many ways, but it’s also completely fair. Once you understand this, you’ll have a much better time playing it. It’s not just the fantastic gameplay depth, or the outstanding narrator, that makes me itch to start the game up again, it’s the awesome challenge that, once endured, provides the player with an incredibly satisfying sense of accomplishment. The story is kind of vague, but there’s no way you won’t understand the horrors that took place at the manor. Throughout your gameplay, the narrator will explain, with harrowing descriptions, how everything went horribly wrong and how evil was unleashed upon the world. The player needs to recruit party members from the Stagecoach, and send them to explore deep down into the dungeons, hoping they will come back with riches and a lot tougher than before. 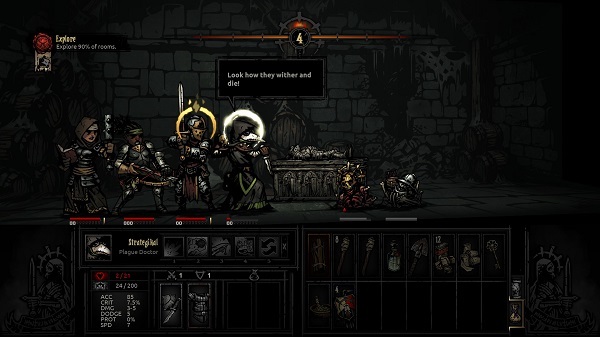 There are four dungeons – read, missions; in the game. Each requires a completely different take on strategy and party build. 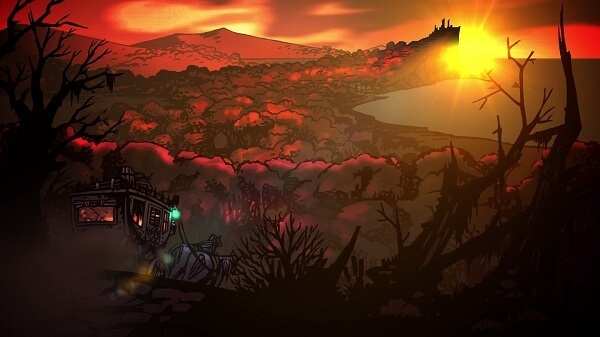 There’s a fifth dungeon that represents the endgame, called rightfully so, the Darkest Dungeon. You’ll be always grasping at straws, hoping that the next room won’t mean the end of one of your maimed, but powerful, party members. It’s that exhilarating feeling that comes with the unknown that makes Darkest fantastic – will the enemy hit a critical, thus eliminating my brilliant Jester, or will he live to fight another day, err, room? You can cut the tension with a butter knife, and this results in an adventure of its own, where coming out victorious is all the sweeter. However, I found Darkest to be a little bit of grind, at times. It’s a game that demands strategic thinking and a whole lot of perseverance. If you’re more interested in a full-fledged story, I don’t really think DD is the game for you. Yet, hard-core rogue-like gamers will absolutely love its gameplay systems, with the party composition mechanic being the gem of it all. There are 14 types of heroes to choose from, which means there is no shortage of options on how to build your party – more so, when other traits are thrown in the mix, arranging a team to go into a dungeon requires a lot of thinking. This game really encourages players to experiment all sorts of builds, because, that way, you will end up assembling an A-Team – just don’t expect to have one in the first few hours of the game, or you’ll be highly disappointed. Despite its strong dependency on dungeon grinding, it doesn’t get boring, nor old. Mainly because the sheer amount of work you need to put into assembling a party. 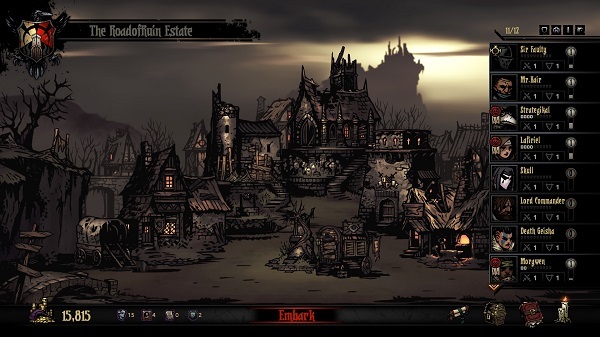 Take the Vestal and the Crusader, they’re excellent when fighting the undead, but they are not the best choice for The Cove, where the Plague Doctor thrives, due to his status effect-driven attacks. 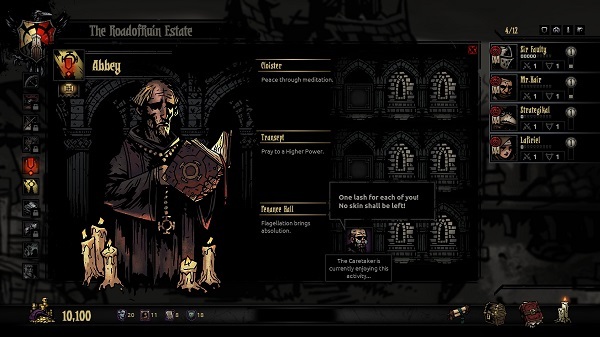 The Occultist may feel quite weird at first, and you, most likely, won’t know how to start playing him, but as soon as you embark the hero on an adventure and put him face to face with evil, you’ll see that his marking abilities and strong back rank attacks make him a fantastic support character. The Abomination, however, while proving to be a massively powerful offensive character, when he enters beast mode, will impact your other party members by increasing their stress level. Furthermore, Crusaders, who are highly religious characters, will refuse to team up with Abominations, forcing you to re-think, and make all sorts of sacrifices if you want a strong composition. Inevitably, you’ll fall in love with certain heroes – most likely with the ones that perform well for you early on. But, as the game progresses, eventually, some of those that you’ve grown fond of, will be a huge liability. As you take your characters from dungeon to dungeon, straining them through countless battles, they’ll amass personality traits, and sometimes they aren’t that great. If you want to cure a negative trait, then you’ll have to cough up a ton of gold, which I can assure you that you won’t have, and ignoring them is too dangerous. A beloved-hero of mine developed a negative trait, which made him open doors without the party first checking for traps. Another one gained the Abusive trait, which increased the stress level of my other party members by shouting incredibly selfish demands at them. Besides your, unsurprisingly, essential life bar, you have another gauge that is as equally as important – the stress meter. The stress meter, when maxed out during a dungeon run, will make your characters masochistic and selfish, thus forcing you to spend your hard-earned gold by reducing their stress at the local tavern. Or, the more simple of routs, by releasing them from their sort-of contractual obligations. You need gold to buy torches – and trust me, you need a lot of them; supplies, weapon upgrades and such, it’s better to let them go their merry, insane way. Gold, a ton of gold, is needed if you want to move forward and tackle Veteran dungeons, which are unlocked once you start getting your characters to level three. Yet, these Veteran dungeons are quite hard, and trying to finish one of them with a team that just barely made it out of Apprentice-level areas, is downright impossible. This means that you’ll have to grind the starting dungeons until you amass a sufficient amount of upgrades. Until you’ve managed to make two or three teams of A-class warriors that can be switched between them, as to not overburden folks with stress, you don’t have a place in Veteran-level dungeons. Basically, that’s the jest of Darkest, finding the perfect way to build more powerful teams that you can send on adventures. It takes a lot of patience on your behalf, but I haven’t played a rogue-like game like this in a long time. Why do I keep coming back to Darkest Dungeon if it requires so much grinding? Well, because it’s fun. It’s highly entertaining because of the well-thought game mechanics, and, to be frank, I really don’t mind scavenging the same old dungeons until I get enough loot, or gold, so I can move forward. I love it, and I recommend you get your rogue-like on with Darkest. Yet, be careful on how you maintain those stress levels, and, the best piece of advice I can offer you – buy a lot of torches! You can download Darkest Dungeon from Steam or from GOG – it costs $19.99. PS4 and PS Vita version of DD are set to hit the streets in Spring of 2016. Decided to make gaming addiction his job, Louis started blogging four years ago. 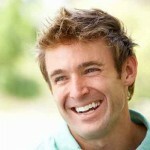 He defines his gaming style as aggressive, but as a blogger he is willing to show more of his supporting skills. Louis’s platform of choice is Playstation, and among his favorite game genres are racing, shooting and war games. He also enjoys computer games, and his first choices are Word World 2 and Spaceward Ho. He describes himself as a difficult to impress gamer because above all effects he seeks for design artworks. When not into gaming, he enjoys spending time with his fiancée.